“I’m taking my talents to … ” Nobody knows how that sentence ends in the summer of 2018, except maybe LeBron James and his closest family and friends. All anyone can do for now is speculate. And that wild speculation, combined with persistent whispers and rumor-mongering, over where “The King” will build his next castle is doing a number on the betting odds for the 2018-’19 NBA Championship. James, 33, has been down this road before: He left the Cleveland Cavaliers for the Miami Heat in the summer of 2010, then came back to the Cavs four years later. Along the way, LeBron brought titles to both cities and went to eight straight NBA Finals. Even though Cleveland came up short in the end this year against Golden State, James carrying a wholly ordinary team as far as he did — averaging 34 points, 9.1 rebounds, and 9 assists in a staggering 41.9 minutes per game in the playoffs — made clear that he is still capable of turning any ol’ team into a title contender and any contending team into an odds-on favorite. The lines have to be adjusted every time James is allegedly spotted house hunting or visiting schools. At Wynn Las Vegas, the Cavs opened as a 60/1 long shot to win the title, based on the assumption that James wouldn’t be coming back. Now that the winds are blowing at least lightly in the other direction, with talk that LeBron might stay if Cleveland can recruit another all-star caliber player like Kemba Walker to join him, that line is all the way down to 20/1. The 76ers opened at 9/2 based on the possibility of a core trio of Joel Embiid, Ben Simmons, and James. As LeBron-to-Philly talk has cooled, the Sixers, despite expectations that they will still find a way to add some impact free agent, have tumbled all the way to 10/1. The big mover in the opposite direction has been the L.A. Lakers — although you might not know it from Wynn’s lines, which took a conservative opening position of 12/1 on the Lakers and have only lowered that to 9/1. Elsewhere, there’s been quite a bit more Lakers line movement on the strength of not only LeBron rumors, but Kawhi Leonard talk as well. Westgate had 20/1 odds posted last week and shrunk them all the way to 6/1 after a flood of action came in. That’s right, 6/1 to win the championship for a team that has gone 126-284 (a .307 win rate) with zero playoff appearances over the last five seasons! That’s as strong a statement about the power of LeBron as him scoring with Marcus Morris draped across his shoulders in the Eastern Conference finals. Still, logic says James can’t do it all himself. Speaking of the Warriors, their odds at Wynn have actually narrowed slightly in the midst of all this James speculation. Avello says a year ago he opened Golden State at about 2/3, but when he opened them at 6/5 this year, allowing bettors to get them at plus money instead of laying money, the defending champs quickly got bet down to even money. Every time a story floats suggesting LeBron isn’t headed to a ready-made contender like the Houston Rockets, Boston Celtics, or Philadelphia, Golden State’s vice grip on next year’s title gets tighter. Technically, the NBA rules prohibit teams from negotiating with free agents before July 1. But players will talk to other players and explore their options, obviously. It’s not like LeBron is just sitting around playing Fortnite with his kids and getting caught up on Westworld until midnight on July 1. He might or might not know where he’s going, but he’s poked his head out enough to lead others in the know to spread rumors. Former Miami teammate Chris Bosh publicly speculated that James will go to Houston. Former NBA player Gary Payton claimed that LeBron James Jr. has committed to playing high school ball at Sierra Canyon High in the L.A. area — a sign, in theory, that LeBron Sr. will be wearing purple and gold. This all puts oddsmakers in a precarious position, as inside information could definitely create an edge for bettors. But Avello doesn’t sweat it. Inside information can only have so much impact anyway, as far as the ultimate victor of the NBA title is concerned. A team still has to win the games on the hardwood while surviving critical injuries and the vagaries of streaky shooting. That said, inside information can very directly determine the outcome of a straight-up bet on where LeBron will land. Those wagers aren’t offered in U.S.-based casinos (though Avello says Wynn could post such a line if they wanted to), but they can be found at offshore books. One current line has James at -150 to go to the Lakers, +450 to sign with Philly, and +500 to stay in Cleveland. Meanwhile, Kawhi Leonard, who stole headlines last week by demanding a trade from San Antonio, is listed at an offshore book at -200 to go to the Lakers. Leonard, particularly coming off an injury-plagued season, doesn’t have anywhere near the solo impact of LeBron. But if you truly believe both superstars will end up in L.A., suddenly that 9-1 futures bet gets tasty looking. One notable thing about the NBA championship odds is how top-heavy they are. If you aren’t Golden State, Boston, or a high-likelihood LeBron destination, your odds are 35/1 or higher. Twenty-one of the 30 NBA teams are listed by Wynn range from 75/1 to 500/1. Hypothetically, what if James surprised everyone and took a one-year deal to team with Anthony Davis in New Orleans? If someone had inside information suggesting that could happen, a bettor would be getting the steal of a lifetime at a price of 75/1. Of course, the whole cottage industry that is following LeBron James’ every inhale and exhale rests on the belief that he remains the best player in the league and will not suddenly hit a wall after playing 54,347 professional minutes in the regular season and postseason combined. There’s no evidence to suggest a LeBron decline is coming. But it has to start sometime, right? Until it does, every little LeBron rumor impacts the title odds. 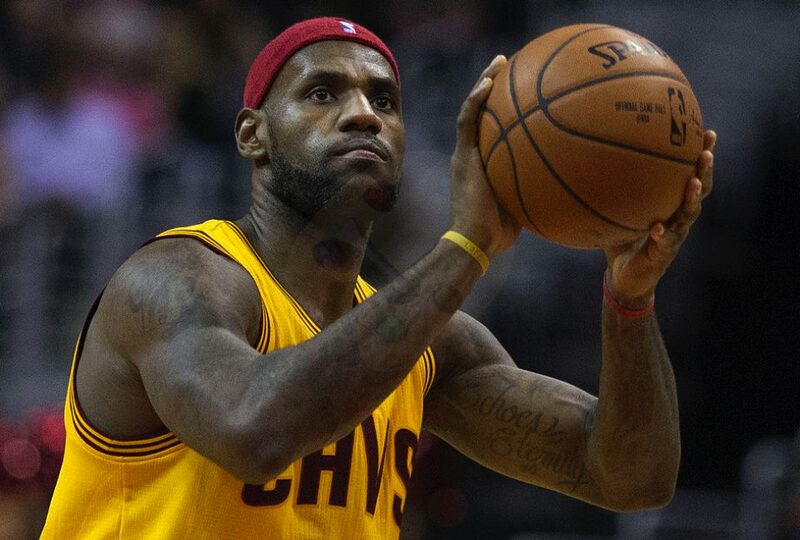 The Warriors are the champs, but when it comes to keeping the bookmakers busy, LeBron James remains the king. Are The Mizrachis Now The First Family Of Poker?